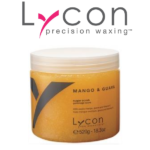 Ideal after exfoliating with LYCON Coconut & Vanilla Sugar Scrub. Instantly boost hydration from head to toe with LYCON Spa Essentials – Body Lotions. These effective, non-greasy formulas are ideal for all over body pampering, manicures, pedicures and after waxing care. Be the first to review “Lycon Coconut & Vanilla Lotion” Click here to cancel reply.